The Rufus Reid Quintet features Steve Allee on piano, Duduka Da Fonseca on drums, Freddie Hendrix on trumpet, and Gary Bartz on alto sax. 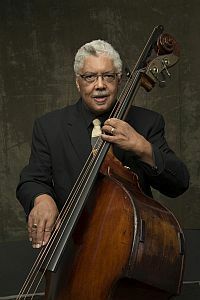 Award-winning bassist, educator, and composer Rufus Reid has been playing jazz for over fifty years. He was influenced by the greats and even had opportunities to play among them. Now, he is a highly sought-after teacher and mentor in the jazz community. This year, Reid released the album Quiet Pride – The Elizabeth Catlett Project to critical acclaim, bringing Catlett’s striking sculptures to life with music composed for large ensemble. Reid brings his quintet of star players to Baltimore for our 24th season opener. For more information, please visit www.rufusreid.com. IT'S NOT TOO LATE TO SUBSCRIBE! One of Baltimore's premiere jazz concert series for over two decades, the Baltimore Chamber Jazz Society programs some of the finest artists in jazz today. This season, all concerts in the Five at 5 series take place at the Baltimore Museum of Art. For more information, please call the 410-385-5888 or visit www.baltimorechamberjazz.org.